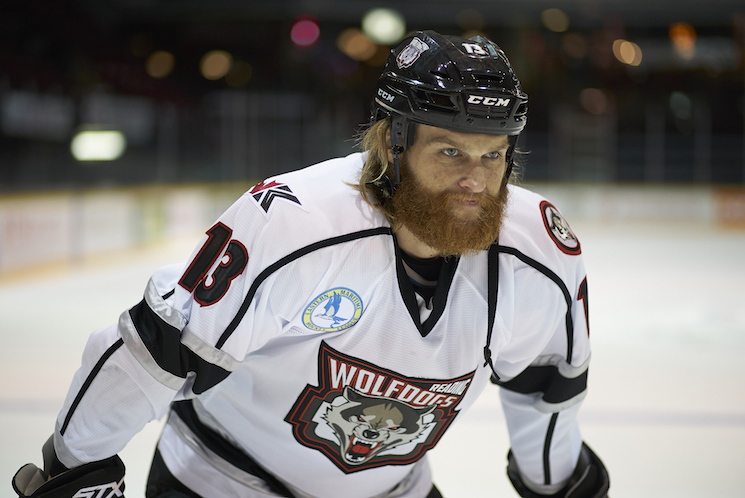 As a former professional hockey player and a Hollywood actor (born to Kurt Russell and Goldie Hawn), Wyatt Russell would be hard pressed to find a more fitting film than Goon: Last of the Enforcers. After getting a call from director Jay Baruchel, who was in search of a star that could also play the sport, Russell laced up his skates and hit the ice. "I remember watching [Goon] on Netflix and thinking it was incredible, I loved it," Russell tells Exclaim! "At first I was trepidatious — Slapshot 2 wasn't very good, right? But after reading the sequel and talking to Jay, I was interested in the way he saw it, taking the nature of the first film and creating what he called 'a hockey superhero movie.'" Last of the Enforcers finds Russell in the role of Anders Cain, the hotheaded antagonist of career enforcer Doug Glatt (Seann William Scott). Cain is very much the villain to Glatt throughout the film, even when briefly playing together as teammates for the Halifax Highlanders. Russell tells Exclaim! that Baruchel had written the character in the mold of Philadelphia Flyers legend Bobby Clarke, a player known as much for his grit and tenacity as his talent. Cain's fiery on-ice presence has a different dynamic off the ice as the son of Highlanders general manager and former star player Hyrum Cain (Callum Keith Rennie). As viewers will see, both their personal and professional relationships are resentful ones. Russell says that although it wasn't as pronounced in real-life, the challenging relationship between hockey parent and player is something he noticed climbing the ranks as a player himself. "Earlier on in my life I saw some altercations between dads and their sons," he recalls. "It's a hard thing as a young kid — you don't understand that tough love your father is showing you, and it can go the other way for the dad in thinking 'well, I can't hug my son, because then I'll show weakness.' That type of thought is really detrimental to a person's life and career. I saw some of it and said 'I'll never be like that.'" When it came to his own career, Russell was a much different skater than the one he plays onscreen. As a goaltender, he played Junior A hockey in British Columbia and Ontario before making the jump to the NCAA level for the University of Alabama-Huntsville, eventually playing professionally in the Netherlands and Germany. Russell was forced to leave the game he loved due to a career-ending injury, not unlike Glatt in Last of the Enforcers. Finding common ground in the storyline despite different battle wounds, Russell reflects on his own exit from hockey as a timely decision, in case his burgeoning acting career wasn't enough of an indicator. "I never looked back wishing I could still play," he continues. "I only ever thought about the people in the locker room — the guys. That environment can only come from being on a sports team, but that camaraderie and feel of fighting for a common goal exists in making movies too." Goon: Last of the Enforcers opens across Canada on March 17.